Musician, Geek and German. It's-a-me. Deep inside we all want it. Some of us, however, don’t fully know of the importance of Confidence. but I wanted to give you my own conviction. 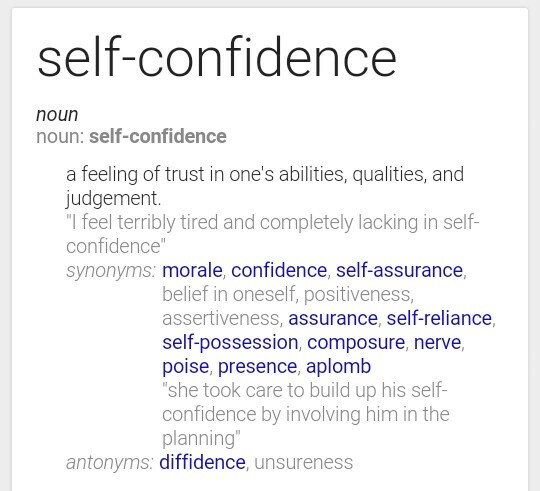 So first of all, what exactly is confidence? Let’s say you’re currently in a really important football match for your team, maybe a cup final. Your team is 3:0 down at half time. If you lack the confidence in your ability to win, you will play like you’re telling yourself : “You don’t have a chance anyway, you’ll lose.” But if you believe in your strengths and your ability to turn the game around and win in the last half of the game, you have a higher chance of winning, because you play like you really want to win the game and believe in your ability to do so. This aspect of Self-Confidence is one I can really relate to. Instead of focusing on all the wrong you’ve done, try focusing on everything right in your life, what you have achived and what you will achive. This does not only help you obtain a healthy amount of Self-Confidence, but it makes you seem like an overall happy person. Any single one of your friends can tell you that they know someone who is constantly negative and feeling down, and how much they dislike him. We want to be happy and people around us want to be happy and be around happy people, so please, be happy about what you can do. Believing in your choices and convictions, beliefs. This, in my opinion, is the most important part of optaining a healthy amount of confidence. If you stand up for and represent your beliefs and what you think is right, you will not only feel like a strong independent person, but also be seen as one. You will have a much easier time getting a job, a partner or anything else that involves other human beings, if you stand out from the whole crowd of other people. This is only achieved by being a critical thinker and not doing everything other people tell you to do. Once you’re able to stand for your beliefs, you will be feeling better about your qualities and abilties. Now you might be asking yourself : “So how exactly can I obtain confidence?” This is not an easy question to answer, so I will tell you about the people who helped me unlock my confidence.